1985 marked the year when Mem V. Stein decided that it was time to form a thrash metal outfit based out of Germany, that would embrace the sound and the feel of his favorite bands form the thrash metal genre to the fullest degree. With that in mind, the 17-year-old metal head plowed his local scene to find suitable players with the same vision; creating fast and furious thrash metal with over-the-top vocals and twin guitar assaults. Mem found his partner in crime, guitarist Ray Mensch, at a Slayer show in the same year, where both of them were hired to perform local road crew duties. The president of the VENOM’s LEGIONS/Germany Chapter, Matthias Prill promoted the highly popular show. Mem was impressed by Ray’s appearance, long hair, torn jeans, and asked the guitarist to journey to Wiesbaden, where Mem had a rehearsal space built at his father’s garage. Ray agreed to come out within a few weeks and the two musicians began writing material by them selves in the rehearsal room. Mem was playing bass and performing vocals duties while Ray was playing guitars. However, Mem remembered a drummer with whom he had played in an earlier band of his and who was out of a gig at the moment. Syke Bornetto, who also lived in Wiesbaden at the time tried out for Mem and Ray and was recruited by the two for the job. The only missing piece at that point was a second guitarist. Ray befriended a young military dependent guitar player from Hawaii by the name of Paul Arakaki, whose parents were stationed in Germany and who was eager to show off his chops. 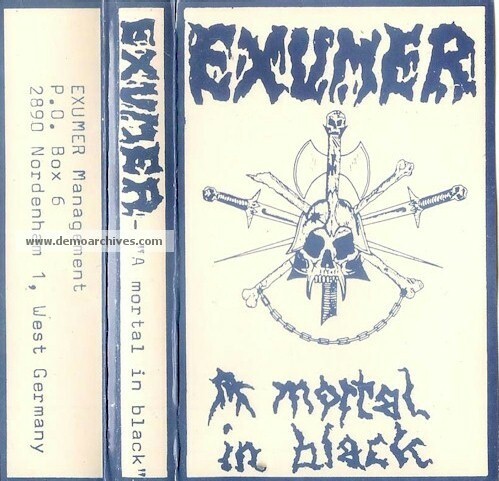 Paul completed the first line-up of what became EXUMER, in late summer of 1985. The four-piece wrote material and rehearsed at a grueling pace and soon it became evident that Paul could not meet the heavy academic workload of high school and keep up with rehearsals. Mem who was ever pushing the project forward asked Ray to look for another guitarist who could meet the demands of the band. Bernie Siedler entered the line-up in fall of ’85 and became the last addition to the roster before the band went on to record their first and only demo in December of the same year. Ralf Ludwig who was CELTIC FROST’s fan club president at the time distributed the “A mortal in black” demo. 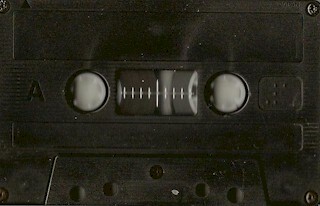 The tape received mixed reviews in the metal press. The demo was quickly sold out despite the press clips and the band severed ties with their manager after he refused to pay the band their share of the profit from the demo sales. The signing of the band lead to booking time with Harris Johns at the Music Lab studios in Berlin, spewing out the band’s cult classic thrash whirlwind, “Possessed by Fire” LP. Pro covers. Studio Tapes. Need more info.